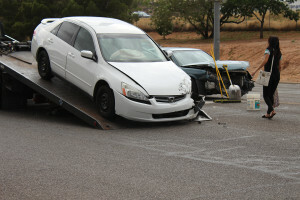 ST. GEORGE — Traffic had to be rerouted around a collision at the intersection of Red Cliffs Drive and Mall Drive in St. George late Friday afternoon after a driver failed to yield the right-of-way and crashed into another vehicle. A 17-year-old girl driving a blue Hyundai Sonata was turning left from Red Cliffs Drive onto Mall Drive, St. George Police Lt. Joseph Hartman said, when she failed to yield and collided with a white Honda Accord that was traveling eastbound through the light on Red Cliffs Drive. The driver of the Accord was a 21-year-old man, and a 19-year-old woman was riding as a passenger in the vehicle with him. A juvenile girl was riding as a passenger in the Sonata at the time of the accident. Both people in the Accord reported minor injuries but refused ambulance transport to the hospital. The teen and juvenile in the Sonata did not report any injuries. The disabled cars blocked traffic on both southbound lanes of Red Cliffs Drive, and traffic had to be rerouted onto the northbound lanes while the scene was attended to by responders. The teen driving the Sonata was cited for failure to yield. In addition to the St. George Police Department, the St. George Fire Department and Gold Cross Ambulance responded to the accident.